Idrisida monero, stampita ĉe al-'Aliyah, Maroko, 840. La Idrisidoj (arabe الأدارسة al-Adārisah, Berbere: Idrisijen) estis araba Zajdisma-Ŝijaisma dinastio de Maroko, kiu regis el 788 al 974. Nomita laŭ la fondinto Idris la 1-a, nome pranepo de Hasan ibn Ali, la Idrisidoj laŭ kelkaj historiistoj estis fondintoj de la unua ŝtato en Maroko. ↑ Idrisids, Brian A. Catlos, Medieval Islamic Civilization: An Encyclopedia, eld. Josef W. Meri, (Routledge, 2006), 381. ↑ Moroccan Feminist Discourses. Fatima Sadiqi. 2014, paĝo 46. Ch.-A. Julien, Histoire de l'Afrique du Nord, de la conquête arabe à 1830 - Tome II, p.44 (eld. Payot, 1961) : "Idriss Il n'était pas seulement un fondateur de villes, il fut le fondateur du premier État marocain"
Ruth Cyr, Twentieth Century Africa, iUniverse, 2001 (ISBN 9780595189823), p.345: "In 788 Idris, the first Arab ruler of the whole of Morocco, united the Berbers and Arabs under his rule, creating the first Moroccan state. He founded the Idrisid dynasty that reigned for almost two hundred years." ↑ (2002) North Africa. Infobase Publishing. ISBN 978-0-7910-5746-9. : "Some historians believe that this was the beginning of the first Moroccan state, but it did not encompass the entire area of modern-day Morocco. 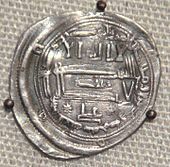 Certain territories remained under the control of the Umayyad emirs in southern Spain or the Fatimid empire, as well as several Berber confederacies that maintained autonomous rule in neighbouring territories"
Ibn Abi Zar, Rawd al-Qirtas (enhavas kronikon de la dinastio). Ĉi tiu paĝo estis lastafoje redaktita je 06:49, 23 okt. 2016.